As the oldest medicine in existence (over 5,000 years old) acupuncture has been helping people with nearly every condition. As acupuncture points are found all over our bodies, the technique provides seemingly endless benefits. From helping with everything from sinus pain to shoulder discomfort, arthritis to migraines, asthma to plantar fasciitis, acupuncture is renowned for healing musculoskeletal injuries. We’ve even seen acupuncture help women who are trying to get pregnant. Dr. Dan Joseph has been helping Peoria heal with this form of Traditional Chinese Medicine since 2001. The medical theory of acupuncture focuses on the notion of qi energy (pronounced “chee”). Qi is said to flow through the body’s meridians or energy pathways. Meridians match specific organs or groups of organs. Unlike conventional Western medicine, traditional Chinese medicine takes the approach that disease is due to an imbalance of this energy’s flow through the meridians. 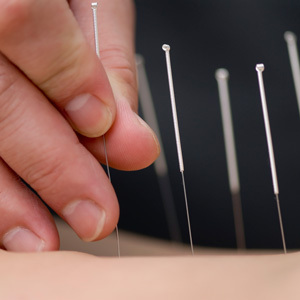 In an effort to unblock or redirect the flow of energy, acupuncturists shallowly insert ultrathin needles into specific points in the skin tissue. These points are called acupoints. Acupuncture should not cause any discomfort. It’s thought to be reasonably comfortable. You may detect a quick pinch when the needle is inserted, but that sensation will quickly pass. Most patients find acupuncture to be highly relaxing and some fall asleep during treatment. Be sure to tell Dr. Dan if the procedure is uncomfortable for you. He can take steps to ensure your complete comfort. Anytime the skin is pierced there is the risk of infection or damage to the structures that lie beneath. Dr. Dan is fully trained in preventing and managing any adverse effects from the needles. Experience firsthand the benefits of acupuncture. Contact Joseph Health Group today to book an appointment with Dr. Dan.